Trump Goes to Asia: What's on the Line? Donald Trump’s first trip to Asia won’t be a walk in the park. The White House has confirmed that U.S. President Donald Trump is set to make his third large presidential foreign trip. This time, he will travel to Asia for the usual round of November summits, in addition to more than a few tense bilateral meetings with allied leaders who have grown increasingly concerned about U.S. policy towards the Korean peninsula. From November 3 to 14, Trump will travel to Japan, South Korea, China, Vietnam, the Philippines, and stop over in Hawaii on his way back. While in Asia, in addition to his bilateral meetings, Trump will participate in the Asia-Pacific Economic Cooperation meeting as well as the Association of Southeast Asian Nations summit (and its associated meetings). 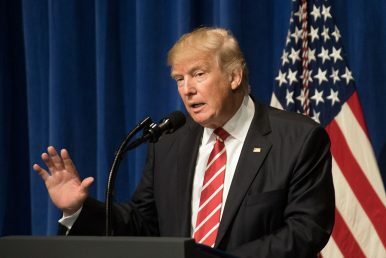 The agenda in Asia, from the perspective of the White House, is relatively simple: emphasize the administration’s “America First” priorities on trade and win assurances from regional leaders that they will rein in North Korea. But this trip will be anything but simple. Perhaps the overriding task for Trump’s trip will be assuring Japan and South Korea of a coherent strategy towards dealing with the problem of North Korea’s nuclear weapons and ballistic missile programs while also reassuring them of ongoing US extended deterrence commitments. The “decoupling” cat came out of the bag earlier over the summer, when North Korea twice showed its intercontinental-range ballistic missile capabilities. We have already seen bilateral US-Japan and US-South Korea statements draw attention to the sustainment of extended deterrence commitments in the age of the North Korean intercontinental ballistic missile. While in Seoul and Tokyo, Trump will have to make that clear himself. As we saw with his speech earlier this year to NATO leaders in Europe, this might not be the easiest task. It is one thing when skittish allies see the boilerplate language on the “ironclad” US-South Korea and US-Japan alliances in statements released by the Department of Defense or after high-level bilateral talks, but a presidential assurance will be necessary. In China, too, Trump will have the challenging task of managing a bilateral relationship that has very much left the honeymoon period after the April Mar-a-Lago meeting between him and Chinese President Xi Jinping. China’s acquiescence to two new United Nations Security Council sanctions resolutions has kept it in Trump’s good graces, but the “America First” trade agenda continues to loom large in this relationship. Will Trump take an economic nationalist message with him to Beijing? In Vietnam and the Philippines, Trump will have two very different challenging tasks as well. In Hanoi, he will need to sustain a relationship with an important U.S. partner that was considerably accelerated by the Obama administration in its last year. Though Vietnam’s disappointment at the failure of a Trans-Pacific Partnership trade agreement with the United States included is less palpable now, Hanoi will seek to sustain momentum in its relationship with Washington. In Manila, Trump will come face-to-face with President Rodrigo Duterte, a U.S. ally who had lambasted Trump’s predecessor and flouts human rights. Trump, who is not known to show even perfunctory concern for human rights issues, will likely be unable to convey U.S. concern about Duterte’s deadly “drug war”, that has claimed thousands of lives to date. Instead, Trump will seek to extend U.S. backing to the Philippines’ fight against Islamic militants in the country’s south and shore up the alliance. Any statements on the South China Sea disputes while in Manila will be closely watched for as well. Perhaps the greatest “wild card” of Trump’s trip will be his presence at the APEC and ASEAN summits. As he showed earlier this year at the G7 and the G20, Trump does not shy away from hot button issues in multilateral forums. He disappointed the G7 leaders with his insistence on excising climate change from the declaration and, at the G20 summit in Germany, he was distracted and absent. Nevertheless, the matter of showing up at all at Asia’s late-autumn summits will be an accomplishment in itself. It will demonstrate to Asian states that the United States, with the evaporation of Obama’s “rebalance” strategy, has not forgotten about Asia. Even if Trump makes a stink about free trade at APEC and attempts to hijack the ASEAN summit agenda with single-minded concerns about North Korea, it was never an assurance that he would endeavor to make the long trip out to the region. Yes, the State Department remains empty and senior diplomatic and defense posts related to Asia remain unfilled, but now that the White House has confirmed that he will head to the region in November, Trump has a chance to come back with important results. In the coming weeks, the White House must ensure that the president is prepared to maximize the results of his first presidential trip to Asia. A version of this article first appeared at the South China Morning Post. It is republished here with kind permission. Donald Trump goes to Asia for the first time as president. What can we expect? US-North Korea: Talking Is Our Only Chance at PeaceRapprochement is a Prerequisite for Denuclearization of the Korean PeninsulaWhere Pessimism Is Realism: The Korean PeninsulaChina Is Standing in the Way of North Korea NegotiationsKim Jong Un Grabs the Headlines At Home, But What Did Trump Get From the Historic Summit?